I could not have been more excited to kick off convocation activities and start classes over the last two weeks. I’m sure you all felt the same. As we start a new academic year, I want to reiterate what was said on stage at Convocation: This institution will focus on students first and student success so students graduate, transfer, or earn certificates. Every action we take, everything we do, will be with that focus in mind. Safety and emergency preparedness were a major theme at this year’s Convocation. The safety and security of our faculty, staff and students will always be a top priority at CSN. At convocation, we eluded to active shooter drills on all of our main campuses this semester. The first of these was to take place on the Charleston Campus the week of September 17. We have decided to postpone that in favor of sharing information about emergency preparedness first. We will deploy Campus Safety Information Teams on each campus on Wednesday, September 19. We encourage you to come learn about our emergency plan, how to sign up for alerts, where to get training and more. Please visit the link below to view the flier with locations and times. My first Convocation Kickoff event last month was both memorable and informative. Thank you all for coming. We have uploaded video and photos of the day’s activities at the links below. This year’s Champions theme could not have been more appropriate as we work to take CSN from good to great. 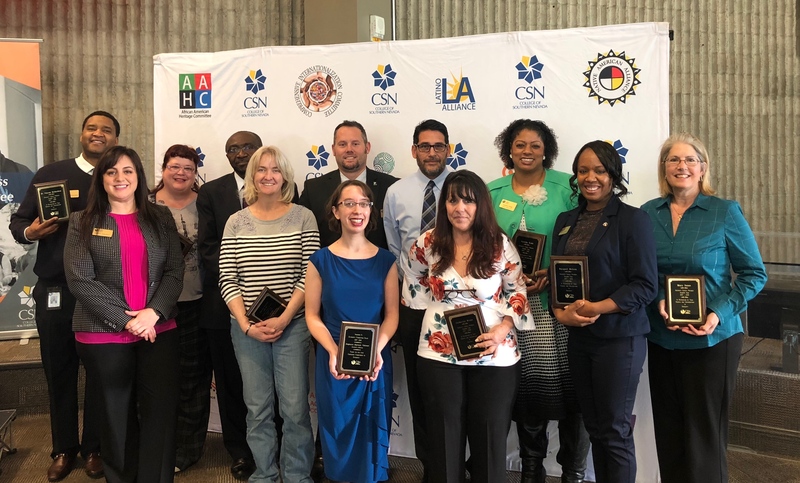 We have a fantastic team of faculty and staff here at CSN, so what an honor it was to stand with the winners of the Excellence and Distinguished Awards at Convocation. Each year, the Internal Recongition Committee chooses honorees from among dozens of nominations. 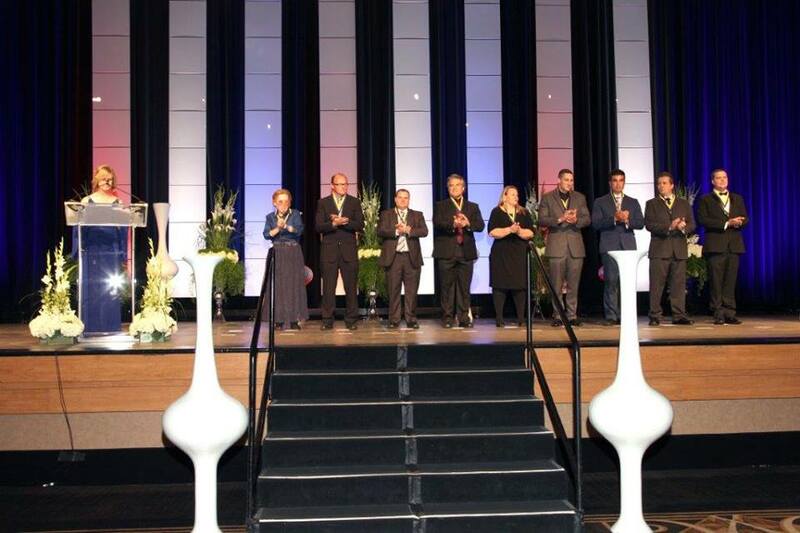 Please join me in congratulating all the winners, and be sure to nominate a colleague next year. Beginning October 21, all official CSN communications will be sent to students’ CSN email. This email address is available to students as long as they are enrolled at CSN. Faculty and staff will be required to communicate only to these addresses, and email forwarding will no longer be allowed. We need your help to make sure students know about this new policy. Please encourage them to check their CSN email daily. October 21 is also the day that enforcement of the Information Systems & Electronic Resources Acceptable Use Policy begins. You can read the entire policy here. It focuses on digital safety and security. Key items you should be aware of is that email seven years or older will be deleted on a rolling basis and your personal network drive (H:) will be limited to 10 GBs. Additionally, a new password tool will be added to GoCSN that will simplify password resets. During your first login on or after October 21, you will be prompted to update your security questions to allow for the ability to self-reset passwords. Again, please spread the word. The Department of Education Office of Inspector General has notified CSN that it does not anticipate recommending corrective action regarding audit results from the Compliance and Federal Verification and Reporting Requirements Audit conducted in June covering the award year that began July 1, 2016, through the June 30, 2017. The office found that CSN completed verification of applicant data in accordance with the federal requirements and accurately reported verification results to the department. CSN will receive a draft of the audit report, to which we will have 30 days for any response. The inspector general expressed that they did not anticipate a need for a response. I want to thank the vice president of student affairs and the financial aid team for their hard work taking care of this matter. Construction has begun on our student unions! Fencing has been erected at all three campuses and site work has begun. Each Student Union will be approximately 29,000 square feet and will provide areas for student government, Student Affairs, a multicultural center, student study and collaboration space, meeting rooms and food service. Food service has been one of the main areas of focus. 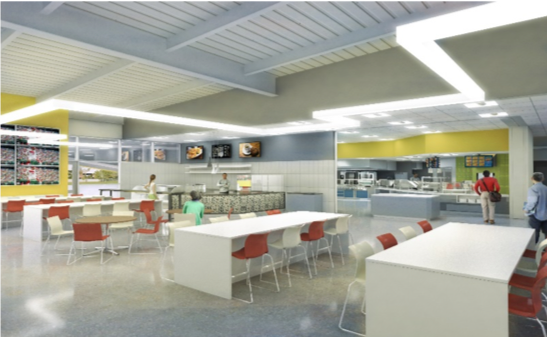 Each union will have a food court, and after formal bidding Culinart was selected for their commitment to fresh food offerings, healthy menu choices, and value, as well as their commitment to sustainability (waste reduction, recycling and composting). In addition to the regular food services, they will also provide catering for the college. These buildings will be much-needed additions to our campuses and are expected to dramatically improve the student experience. They are scheduled to open for the fall 2019 semester. We will be holding our annual CSN Connections events on September 11, 12 and 13. Students can enjoy great music and free food and drinks, and more importantly they can find out how to get the most out of their time here at CSN. We’ll have information on advising, tuturing, transferring, using the library, and almost anything else that can help students succeed. As an added bonus this year, students will be able to attend ASCSN’s Club Rush during CSN Connections. We want our students to be involved in their college, so I welcome the opportunity for them to learn more about the clubs available to them. We expect 20 to 25 clubs to participate. They will be manning tables with information on their activities, how to join and more. Pass the word along to your students. Tuesday, September 11, Henderson Campus, behind the C Building from 10:30 a.m.-2 p.m.
Wednesday, September 12, North Las Vegas Campus, Main Entrance from 10:30 a.m.-2 p.m.
Thursday, September 13, Charleston Campus, D Building from 10:30 a.m.-2 p.m.
We will also have materials available at several Connections table for our MobileSAFETY app and the upcoming Campus Safety Information Team event. As I settle in at CSN and learn more about the college, I also want to learn more about you. I have scheduled a faculty and staff presidential roundtable for each campus later this month. Please come with your questions, your concerns, and your thoughts about how we can make CSN an even better place for our students. We will be annoucing Pizza with the President events in October and we hope you will let your students know about them. CSN’s award-winning Film & Videography Program will present the Seventh Annual Short Film Showcase at 6:30 p.m. Friday, October 12 in the Nicholas J. Horn Theater on CSN’s North Las Vegas Campus. The event is free and open to the public. On display will be films from CSN students, including several that took home Student Production Emmy Awards this summer. This event started as a way to show off the incredible work done by CSN students, and it keeps growing every year. I am so pleased to know that our students are receiving the kind of quality education they need to succeed in so many diverse fields of study. 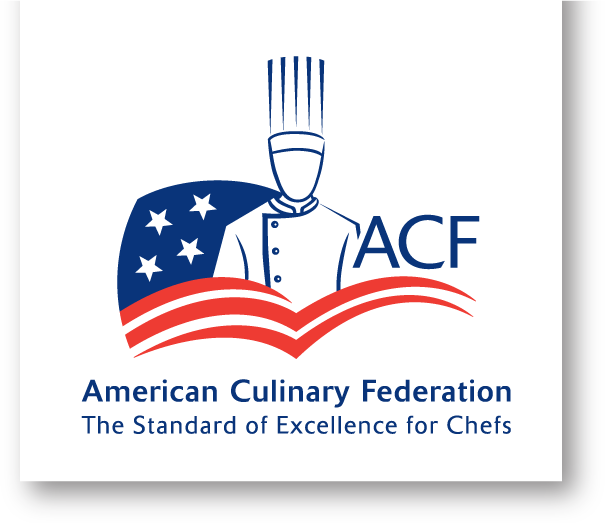 The American Culinary Federation has once again awarded our outstanding Culinary Arts, Pastry Arts, and Food and Beverage Management programs exemplary status and a new seven-year accreditation. The ACF awards exemplary status to programs that symbolize the highest educational standards. This status, which runs through 2025, will make it 21 consecutive years that the programs have earned the distinction. Multiple consecutive exemplary ratings like this are an indication of the integrity and quality of the programs, and the hard work of all those involved. What this means on the ground is that CSN’s students can be assured they are getting the very best education available. Studying in such a top quality program means these students will be comfortable with the rigorous standards that will be expected of them in the job market. The designation gives them a chance to get their Culinarian or Pastry Culinarian certification from ACF after graduation without taking exams. Our students will be one step ahead of the competition – all because they chose to attend CSN. 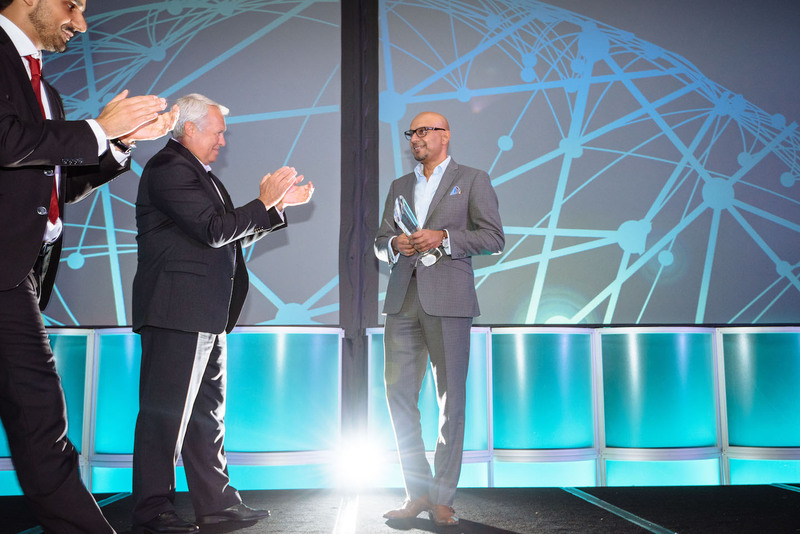 Please join me in congratulating Chief Information Officer Mugunth Vaithylingam for receiving the Most Influential CIO award at 11th annual Global CIO Breakaway Leadership Awards. The honor, which is awarded by peers, is given to those who are identified as breakaway leaders. The Most Influential award is given to a CIO who has an “outsized impact” on their organization. Congratulations, Mugunth. It is well-deserved honor. Look for this section each month to learn about the data that drive discussion and decisions at CSN. Please review the latest enrollment report at the link below. This updated report reflects our fall enrollment through September 5. Visit the Institutional Research web page to see additional enrollment and institutional data. We have received several inquiries surrounding the shooting incident on the Charleston Campus last week. I want to let everyone know that the CSN Police Department has concluded its investigation. An emeritus professor was treated for a self-inflicted injury in the hospital and subsequently arrested and charged with possessing a weapon on campus and other charges. I appreciate all of the expressions of concern and interest, and I pledge to keep everyone updated should the situation change. Please know that if your department would like an individual safety review with the CSN Police Department, you may email Chief Darryl Caraballo at csnpd@csn.edu. 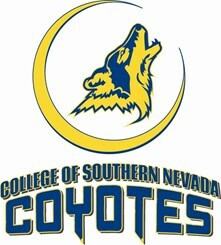 Dr. Federico Zaragoza today became the College of Southern Nevada’s ninth president in its 47-year history. A press release announcing his presidency can be found here. Nevada System of Higher Education Chancellor Thom Reilly said it was exciting for Zaragoza to join CSN. Dr. Zaragoza sent out the message below to the CSN community this morning. I am both humbled and grateful to greet you today as your president. As we begin this new chapter in the story that is CSN, I wanted to share a few quick thoughts and updates with you. First, your collective work has positioned CSN to be a national leader in terms of student success. We will have many opportunities to discuss our students first agenda over the next few weeks at our annual adjunct conference, Convocation and welcome back events. You will also hear about upcoming roundtables and student events in the next few weeks. Second, I want to thank Dr. Margo Martin for her service to the college these last six months as acting president. The direction that she and the executive leadership team have taken the college will benefit us all as we continue to serve our students and begin to lift CSN to national prominence. With this in mind, Dr. Martin will be assisting me as Interim VP of Transition Activities and Clarissa Cota will continue her interim appointment as VP for Academic Affairs through the end of the calendar year. I hope to see you at Convocation on Monday, August 20, as we begin our new academic year. I too am rolling up my sleeves and getting to work. Please reach out to me as you see me around campus and know how excited I am to finally join the CSN family and the wonderful Southern Nevada community. Greetings, Coyote nation! As we gear up for the most exciting time of the academic year – the start of a new semester – I have a bit of news and info to share with you. We’ve had quite a busy break, with events, awards, new classes and new degrees topping the list. We’ve also been preparing for our upcoming Convocation event, including the introduction of incoming President Dr. Federico Zaragoza. 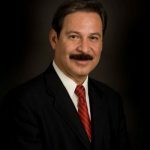 I look forward to welcoming Dr. Zaragoza to southern Nevada and to CSN. I am proud of the state of CSN as this transition approaches, and I want to thank all of you for your support over these last several months. 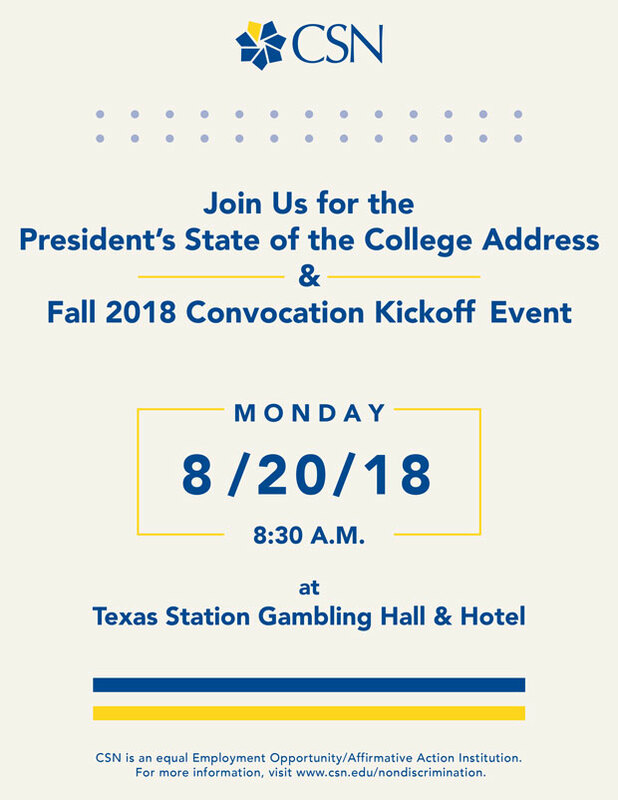 This year’s State of the College Address and Convocation Kickoff Event will be held at 8:30 a.m. Monday, August 20 at the Texas Station Gambling Hall & Hotel. 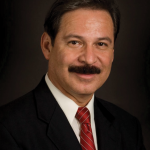 This year’s event is extra special, as our new president, Dr. Federico Zaragoza, will be in attendance. We’ll all kick off the most exciting part of the year together. We’ll also celebrate the accomplishments of our colleagues with the presentation of the Excellence and Distinguished Awards, as well as honor those who’ve been awarded tenure this year. Convocation is a wonderful way to reconnect with your colleagues as the new semester gets underway. Please make sure to join us. We are so grateful to Lt. Gov. Mark Hutchison for joining us last month for Pizza & Politics. 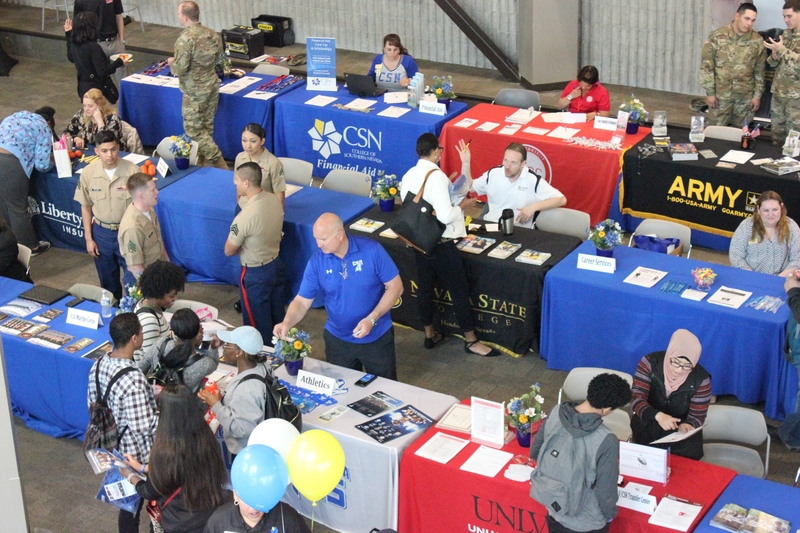 The event covered a range of topics, including jobs, education, scholarships and financial aid, public safety, infrastructure and funding for higher education in Nevada. 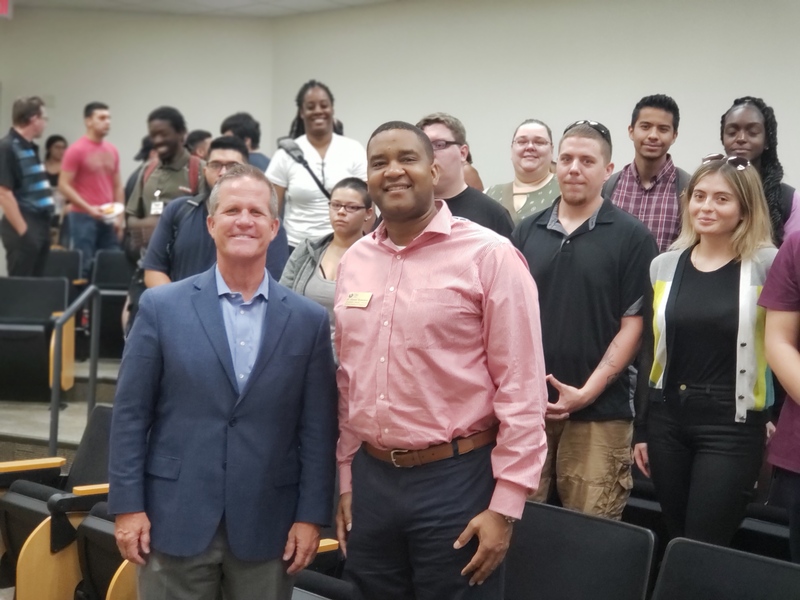 Many of the questions came from students in Dr. Michael Hart’s Political Science 101 class, who attended. The Pizza & Politics events are always a well worth attending, and we look forward to hosting more of them in the coming semester. 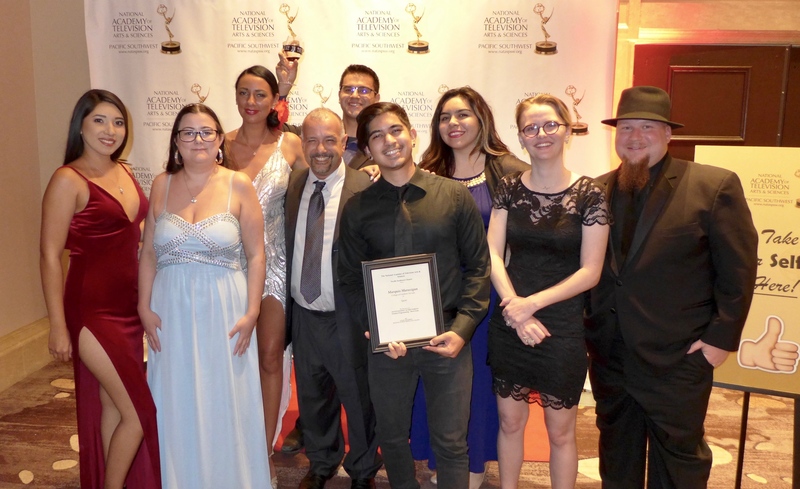 I am thrilled to tell you that CSN Videography & Film Program students won seven Student Production Award Emmys this summer at the National Academy of Television Arts & Sciences Pacific Southwest Chapter Emmy Awards. This was the most of any college in our chapter, which includes San Diego, Bakersfield, Las Vegas, Palm Springs, San Luis Obispo, Santa Barbara and Santa Maria. The winners are: Gabriella Vizcarra for “Intertwine,” (Student Programming – Long Form). Billy Ward for “Rhino Shield: South Africa,” (Student Programming – Long Form & Student Craft – Photographer & Student Craft – Director). Marquis Marasigan for “Spent,” (Student Programming – Short Form). Elisabeth Hatzimarkos for “Just A Normal Girl,” Student Programming – Public Service (PSAs). Marco Tavares for “Who’s OPER,” (Student Craft – Editor). We are excited to debut two new bachelor of applied science degrees this fall, bringing the total number of four-year degrees offered at CSN to seven. The new degrees, in Deaf Studies and Project Management, have received the approval of both the Board of Regents and the Northwest Commission on Colleges and Universities. As with all of the bachelor’s degrees CSN offers, these two will help fill a critical void in higher education locally, meeting the tremendous need in both areas. As a community college, CSN typically offers bachelor’s degrees in niche areas when neither the state college nor either of the universities offers the degree. The deaf studies degree will have an emphasis in in American Sign Language/English Interpreting. There are fewer than 100 nationally certified interpreters in Nevada to serve more than 39,000 people with hearing disabilities. The project management degree is equally vital to the region in fields as varied as construction, computing and information technology and sales. Professional development is about to get a huge upgrade at CSN. 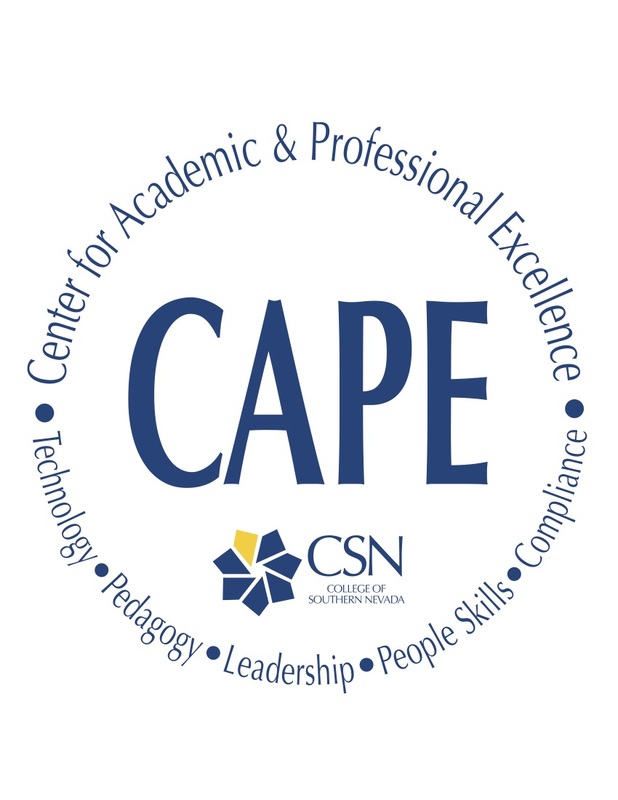 Be on the lookout for announcements from CAPE as they upgrade the registration system to a more robust and dynamic professional development platform. It will feature a personal learning dashboard that will include new features and tools for e-learning and increasing department engagement. 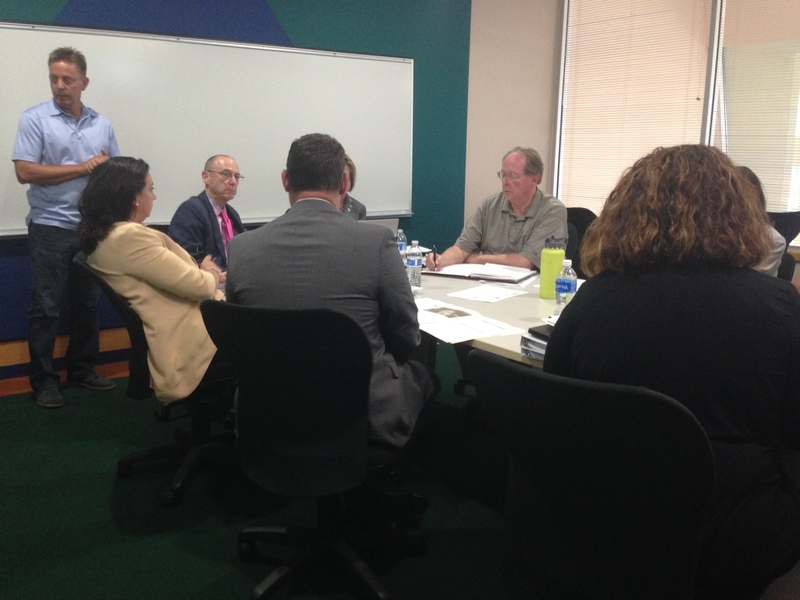 It also allows department heads and chairs to initiate training and view the their team’s progress. We are excited to offer you these opportunities to expand your professional and team development. You’ll hear more on this soon. As we prepare to welcome the first cohort of Nevada Promise scholarship recipients to CSN, we are also now accepting Promise applications for the 2019-20 school year from both new and returning students. The scholarship was originally funded for only the high school graduating class of 2018, but we hope additional funding will be made available by the 2019 Nevada Legislature. The application is open, but will be subject to appropriation, which could happen as late as June 2019. You can learn more on the web page linked below. Students can find the link on CSN’s home page. Please review the latest enrollment report at the link below. This updated report reflects our fall enrollment through July 30. The first enrollment cancellation for non-payment occurs on August 7 with fall classes beginning August 27. Visit the Institutional Research web page to see additional enrollment and institutional data. Faculty, staff and students will be required to use official CSN email accounts for all official communication to and from the college. Emails will be permanently deleted after seven years. Employee H Drive storage is limited to 10 gigabytes for faculty and staff. This storage is not to be used for files or copyrighted materials. Files older than two years will be deleted on an ongoing basis. Your Office 365 One Drive can be used for personal items but should not contain CSN related files or personally identifiable information. The goal here is to make your data — and that of our students — more secure. Using personal email addresses, for example, invites trouble that we do not want. Too often students miss important communications from their college. That should not be happening. Requiring students to use CSN email accounts and requiring faculty and staff to communicate only to those accounts helps us ensure consistent communication. Look for more information from my office in the coming months as we work on implementing this policy. We want you to know what we’re doing, why we’re doing it and what to expect on your end. As always, feel free to ask any questions you may have. Nothing is more important than the safety and security of our faculty, staff and students. We will make public safety a top priority during Convocation Week this year, and we’re already getting started. Last month, CSN Emergency Manager Greg Gammon led me and the vice presidents through a comprehensive exercise simulating a disaster on CSN’s campus. The intent of the drill was to gauge how the executive team handled the aftermath. While I knew the drill was going to happen, none of the vice presidents did. The scenario Greg outlined for us when he interrupted our meeting was that a building on the Charleston Campus was on fire. As he relayed details to us, our task was to come up with plans to meet the college’s needs in two hours, 24 hours, two days, two weeks, a year and so on. While the drill went well, we were by no means perfect. That’s the point though. Now we know what we did right, and what we should focus our improvement efforts on. There will be more surprise drills to come this year. But even if you do not get to be part of one, I encourage each of you to consider how you would react in various public safety scenarios. Protecting yourself, your co-workers and our students should always be your top priority. In our continuous efforts to improve the services offered to students across the college, Vice President Juanita Chrysanthou invited experts from the American Association of Collegiate Registrars and Admissions Officers to CSN this past spring to take a look at how we do things and offer suggestions for improvement. After initial consulations with Student Affairs and others throughout the college on topics including professional development, use of technology, and organizational structure, the consultants last week provided us with recommendations. We are currently reviewing the consultant recommendations and making plans for implementation. We look forward to improving the experiences of staff and students alike. Auditors from the Department of Education Office of the Inspector General visited CSN last month, completing the onsite aspect of their review of our financial aid verification and disbursement processes. They will continue to review records and files remotely off-site. We expect a draft report by September 28, after which we will have the opportunity to review and respond to the report. As always, I will keep you updated as events develop. 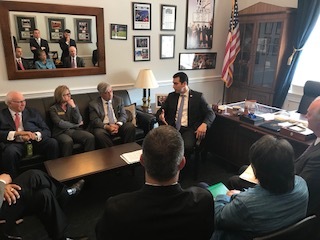 I was delighted to be among a group of 25 local business and community leaders who traveled to Washington, D.C. last month with the Las Vegas Global Economic Alliance and local chambers to meet with congressional delegations and various agencies to talk about policy issues affecting southern Nevada. This meeting, dubbed the Federal Forum, was a wonderful opportunity to talk up CSN’s importance to the region, and the critical need for support from Washington for economic development here. I look forward to working more with the LVGEA and our business community as we strengthen these relationships. 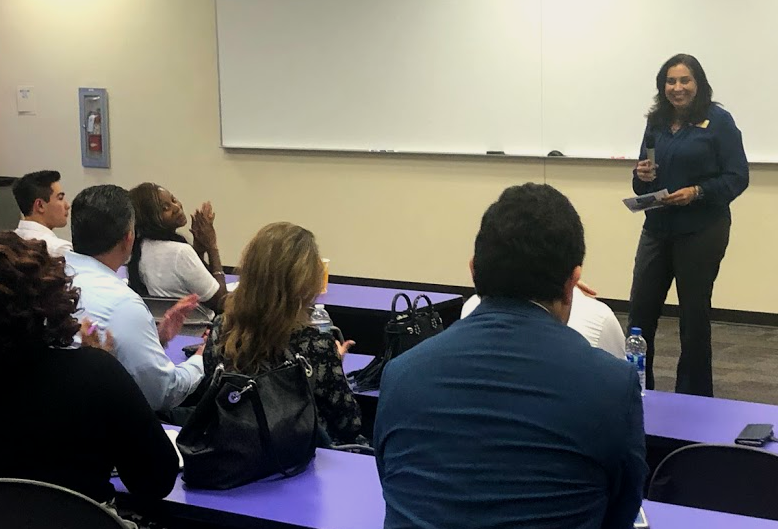 CSN was delighted to collaborate once more with the Latin Chamber of Commerce Foundation, UNLV, NSC and other community organizations to host the 2018 Latino Youth Leadership Conference. This seasoned program has been responsible for connecting high school students with higher education, community engagement and professional opportunities for 25 years. Graduates of the program include industry leaders, government and elected officials, and trailblazers in our state. This weeklong conference develops leadership and life skills every summer. This year, I attended a presidents’ panel that answered questions from students about opportunities in higher education. Students visited CSN’s North Las Vegas Campus, heard from our recruiters and faculty, and learned about our programs of study. CSN is proud to participate every year and hopes to continue this impactful partnership into the future! 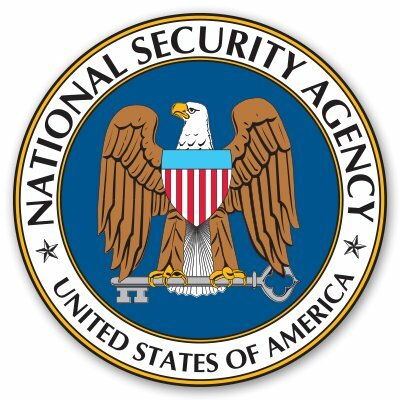 We were thrilled this spring when the Department of Homeland Security and the National Security Agency notified us that our application to become a National Center of Academic Excellence in Cyber Defense 2-Year Education had been approved. 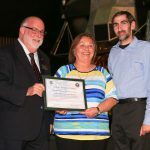 Last month, that designation was celebrated at the National Cyber Summit in Huntsville, Ala. We sent a delegation from CSN –School of Advanced & Applied Technologies Dean Michael Spangler, Computing & Information Technology Chair Margaret Taylor, and CIT Professor Arthur Salmon – to receive the official recognition. Ours is the only program in Nevada with this designation. 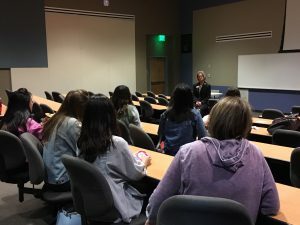 If you were on the North Las Vegas Campus last week you may have noticed 40 or so middle and high school students there. 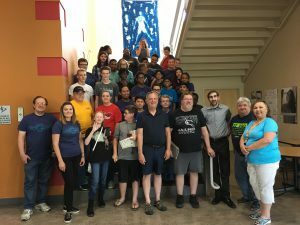 Once again, we hosted the Air Force Association’s CyberCamp, a weeklong camp designed to get today’s young people excited about science and tech careers. Topics covered included digital citizenship, ethics, and security, with a focus on how to be safe on the internet. This event, funded through a National Science Foundation grant via CyberWatch West, is always a lot of fun. We expect to host it or a similar event again next summer. Cybersecurity is an issue of growing importance that we have a responsibility to ensure the next generation of college students is prepared to address. We also had more than 50 students on the Charleston campus last month for the Health Career Exploration Camp. This camp was geared toward students interested in nursing, paramedic medicine, health information and veterinary technology careers. The high school students had the opportunity to use our lab equipment and work directly with our instructors. They learned how to draw blood, run tests, make eyeglasses, and much more. The goal of the camp is to expose students who are interested in health care to several different roles that they might find interesting. Not all health care workers are doctors or nurses, after all. Please review the latest enrollment report at the link below. This updated report reflects our fall enrollment through June 25. The fall semester begins August 27. Visit the Institutional Research web page to see additional enrollment and institutional data. Congratulations to all of our student athletes who shined in the classroom and on the courts and fields this year. We had 27 National Junior College Athletic Association Academic Award Winners! It’s always rewarding to be a part of a student’s well-rounded education. CSN Athletics helps make that happen. A crowd favorite, Pizza & Politics is returning this month. We are excited to have Nevada Lt. 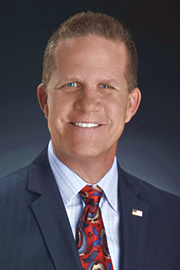 Governor Mark Hutchison on board, scheduled for noon July 23 on the North Las Vegas Campus, Building N, room 103. Watch your email for more information as the date approaches. The CSN Foundation recently received a $10,000 grant from the AT&T Aspire Foundation to support scholarships for the CSN Jumpstart Program. The grant will help low-income high school students obtain college credit. The CSN Jumpstart Program, which began in 2007, works with high school instructors to provide college courses at the high school campus, allowing juniors and seniors to obtain high school and college credit. 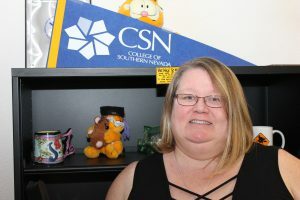 CCSD instructors with collegiate-level credentials are certified through the program to teach CSN curricula so high school students are receiving the same course they would at a CSN campus. This grant will be used for the 2018-2019 academic year. If you’ve done the work, you deserve the credential. Did you know that you may be eligible to receive an associate degree from the College of Southern Nevada (CSN) at no cost to you? The Nevada System of Higher Education (NSHE) has a dynamic process in place, called Reverse Transfer. Eligible students, who have earned 15 or more credits at a NSHE community college and transferred to a four-year NSHE institution where they earned 60 or more credits, may be able to obtain an associate degree for the coursework they completed between the two institutions. That’s right, you may already be a college graduate and didn’t know it! Earning an associate degree is an excellent credential to bolster your resume as you work toward your bachelor’s degree. Last year, close to 150 UNLV, UNR, and NSC students graduated from CSN through the reverse transfer program. Some had earned multiple associate degrees from CSN. Why is an Associate degree important? You would collect the nation’s fastest growing work credential recognized by employers. You would achieve an educational milestone for FREE while pursuing your bachelor’s degree. You become more marketable and qualify for better job opportunities while completing your bachelor’s degree. With an associate degree you become part of the group of students who, according to national data, are 70% more likely to complete their bachelor’s degree. How does the reverse transfer PROCESS work? With your permission, your current four-year institution will send your transcript to CSN to determine if you are eligible to receive an Associate of Science, Associate of Arts, Associate of Business, or an Associate of General Studies. Complete the Reverse Transfer Transcript Request form available at www.csn.edu/reversetransfer and submit electronically to the email address on the form (reversetransferoffice@csn.edu) by the deadline of July 8, 2018. Your reverse transfer graduation form will be evaluated for the August 2018 summer graduation date. There is no cost involved. With your consent by completing and submitting the Reverse Transfer Transcript Request form, your current four-year institution will send CSN your free electronic transcript. 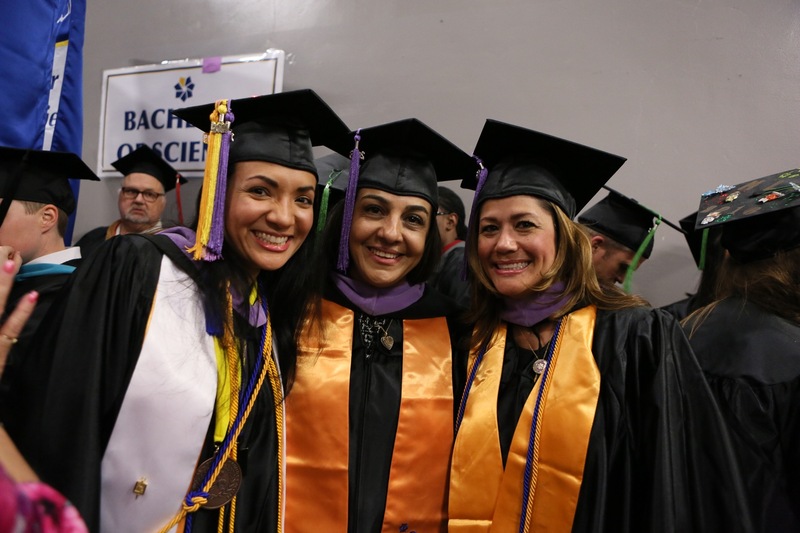 If after completing your graduation audit CSN determines that you have met degree requirements for an Associate of Science, an Associate of Arts, an Associate of Business, and/or an Associate of General Studies, you will be awarded your diploma (s) in August 2018 and become eligible to participate in the 2019 May Commencement Ceremony. For more information about a reverse transfer associate degree, please visit www.csn.edu/reversetransfer or CSN’s Call Center at 702-651-5555. Wishing you continued success in your academic endeavors! Greetings, Coyote nation! What an amazing semester we had! It included another record-sized graduating class, the official kickoff of our student union construction, and of course the selection of a new CSN president. The future looks bright indeed. The announcement last month that Dr. Federico Zaragoza will become CSN’s new president in August has everyone here very excited. I look forward to welcoming him and assisting him with his transition. In the meantime, there is still much work to do this summer, so let’s keep our shoulders to the wheel! We have a group working on convocation planning for fall 2018, and we are convening a shared governance task force this week to explore best practices and make recommendations for committee and council structures that we can implement in the coming academic year. Additionally, there is a team of us preparing for CSN’s mid-cycle visit from our accrediting body, the Northwest Commission on Colleges and Universities, which will occur on October 8 and 9. We are also pushing forward with the transition to a multi-campus district model and all that entails, including launching national searches for vice presidents/campus provosts for the Charleston and North Las Vegas campuses as well as two dean positions. We will also see construction for all three student unions begin before the fall semester starts. Plans are being finalized as we speak. We expect this summer to be busy yet meaningful at CSN. I’m excited and ready for all of it. Go, Coyotes! We held our “construction kickoff” event for the new three student unions last month on the Henderson campus. It was attended by past and present student government leaders, Henderson representatives, CSN executives, faculty and staff. This event precedes the much anticipated start of construction on each campus this summer. Linked below are the logistics plans showing the first phase of construction. These drawings show which areas will be out of service when students return for the fall semester. This schedule is approximate, and it will depend on the progress of the contractor. Facilities will be sending updates throughout the construction period to help inform everyone of the changes that will be occurring during this project. We are on schedule to open the new unions for the fall 2019 semester. We’re excited to announce that we are in the process of refreshing the landscaping outside of the A, B and C buildings on the Henderson campus soon. The existing landscaping contained old and diseased trees that needed to be removed, as well as an irrigation system that was in disrepair. The project will provide a new irrigation system along with fresh landscaping including new trees, groundcovers and flowering bushes. Please see the document linked below for a look at what’s coming. We hope to have the work completed before the end of this month. Last month I brought several faculty, staff and students together for a shared governance task force meeting. We discussed several items including the formation of a main steering committee for shared governance as well as the possibility for smaller groups that can work on other important issues on an ad-hoc basis. We also realized we have some homework to do regarding best practices. We will continue to work throughout the summer and hope to provide comprehensive updates at this year’s convocation on August 20. This fall, CSN will be participate in the Survey of Entering Student Engagement (SENSE), a national survey of institutional practices and student behaviors during the earliest weeks of college. SENSE is an initiative of the Center for Community College Student Engagement (CCCSE), part of the Program in Higher Education Leadership at The University of Texas at Austin. The results will help us better understand the entering student experience at CSN. The survey will be administered during the fourth and fifth class weeks of the fall academic term in classes randomly selected by CCCSE. Instructors whose classes are selected for survey administration will receive further information from CSN’s Institutional Research Department. 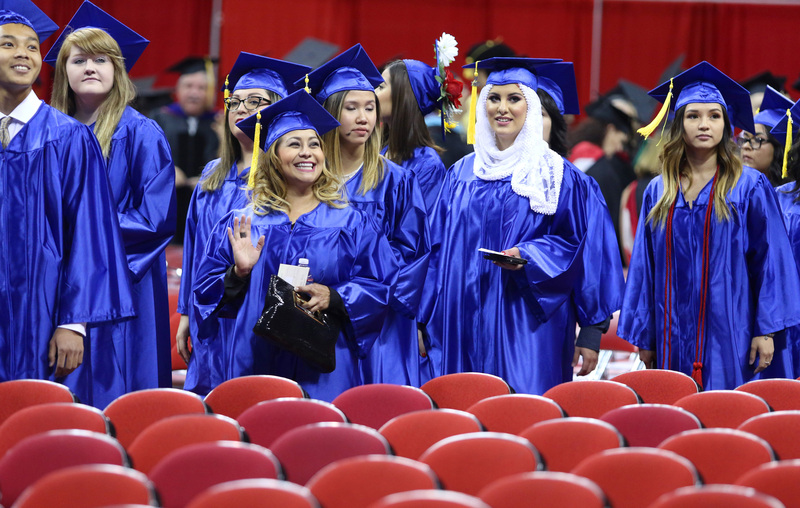 What an amazing Commencement Ceremony we had last month at the Thomas & Mack Center, where we graduated our largest class ever, more than 3,500 students. I couldn’t be more proud of these students, and of the great faculty and staff here who work so hard to help make sure they get the best education available. If you were unable to attend the event, you missed quite a show. 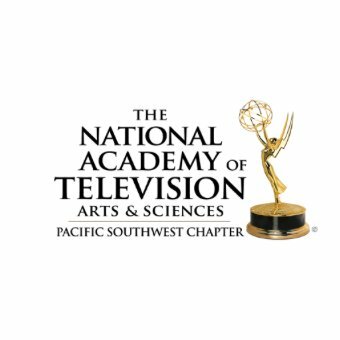 Students from our Videography & Film Program received 12 Student Production Emmy Award nominations and two overall Emmy Award nominations last month! The program has been doing great things these last few years, with 14 Emmy wins last year, the annual Short Film Showcase and the production of the documentary No Greater Odds. This year’s award winners will be announced at a ceremony June 16 in Palm Springs, Calif. Wish them luck! Lumina Foundation, in partnership with the Kresge Foundation, has announced the designation of Las Vegas and six other communities across the country as Talent Hubs. These cities earned the designation by meeting rigorous standards for creating environments that attract, retain, and cultivate talent. Talent Hub cities are focused on raising the nation’s overall post-high school attainment level to 60 percent of working-age adults by 2025 and committed to eliminating deep disparities in educational outcomes among African-Americans, Hispanics, and American Indians, who fare poorly in contrast with white and Asian students. Focusing on the growing disparities in enrollment and completion rates, the Las Vegas area Talent Hub, comprised of partners College of Southern Nevada (CSN); Nevada System of Higher Education (NSHE), Workforce Development; Governor’s Office of Workforce Innovation for a New Nevada (OWINN) and United Way of Southern Nevada, will collaborate to increase the credentials of African American, Hispanic and low income learners. 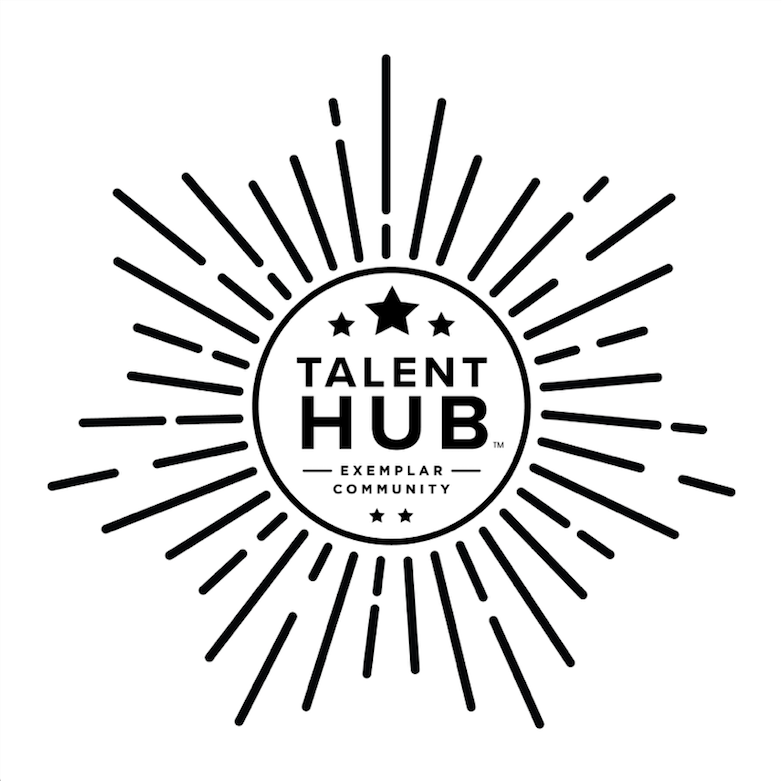 Each community designated as a Talent Hub receives $275,000 in grant funding over 31 months. Grant funding will support local efforts to educate more people, allowing community and education leaders to better meet the specific needs of residents. Lumina will provide these funds in partnership with Kresge. We are thrilled to have this new opportunity to increase college credential attainment in Nevada. I will keep you updated as these partnerships develop. Please review the latest enrollment report at the link below. This updated report reflects our enrollment through May 29. Classes start Monday. Visit the Institutional Research web page to see additional enrollment and institutional data. Greetings, Coyote nation! It’s crunch time, with final exams, commencement and all the celebrations that go along with the completion of another successful academic year. What an exciting time to be on campus! Before anyone leaves for the summer though, I have news to share with you about all that’s been going on at CSN. You may have noticed that CSN’s cybersecurity degrees have been garnering attention. And for good reason. We are now able to brag that we’re a National Center of Excellence for cybersecurity education. Cybersecurity programs train the next generation of people who will protect our nation’s vital information and data networks. The field is growing by leaps and bounds, which is why it’s so important that we received this designation. The Department of Homeland Security and the National Security Agency jointly award the honor to recognize schools that offer rigorous cybersecurity curriculum. What it means for CSN students is that they can be assured they’re getting the highest quality education available. 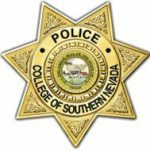 Last week, Chancellor Thom Reilly shared a study and recommendations regarding the consolidation of police services at the Nevada System of Higher Education’s Southern Nevada institutions, including CSN. The study was prepared by the International Association of Campus Law Enforcement Administrators (IACLEA) after a comprehensive review. The Chancellor has indicated that he intends to bring this report to the Board of Regents at the October 19 special meeting in Las Vegas. Feel free to send me your questions or comments once you read the report, and look for more announcements in the coming months. As mentioned in in the governance forum in March, I will be establishing a Shared Governance Council. The council’s first meeting will be in late May. Please look for more information in the next few weeks. It is my hope that we can explore solutions to several issues surrounding shared governance. In addition, at the faculty and staff roundtables I noted that we are conducting national searches for the two new provosts/vice presidents for the Charleston and North Las Vegas campuses, as well as for deans of the School of Arts & Letters and the Ralph and Betty Engelstad School of Health Sciences. I will keep you informed as the process moves along. I will also be addressing other topics that came up during the roundtables and the Pizza with the President student events in the coming months. From fostering student-centered communications and addressing reemdial and basic skills curriculum to academic program evaluation and the rising cost of textbooks, we have a lot to discuss. And we will begin those discussions in several ways over the summer. We will all get a chance to meet them May 8 and 9. The candidates will attend forums on each of our three campuses. Please come meet the person who could be our next president – and bring all of your questions. The finalists’ profile materials are available on the CSN president search website, www.csn.edu/president-search. The CSN President Search Committee and the Advisory Committee will conduct in-person interviews with the candidates on Thursday, May 10. At the conclusion of these interviews, the Search Committee and the Advisory Committee will meet to determine the recommendation of a finalist to the full Board of Regents, who will review and vote on the recommendation at a special meeting later in May. Our biggest event of the year is right around the corner. 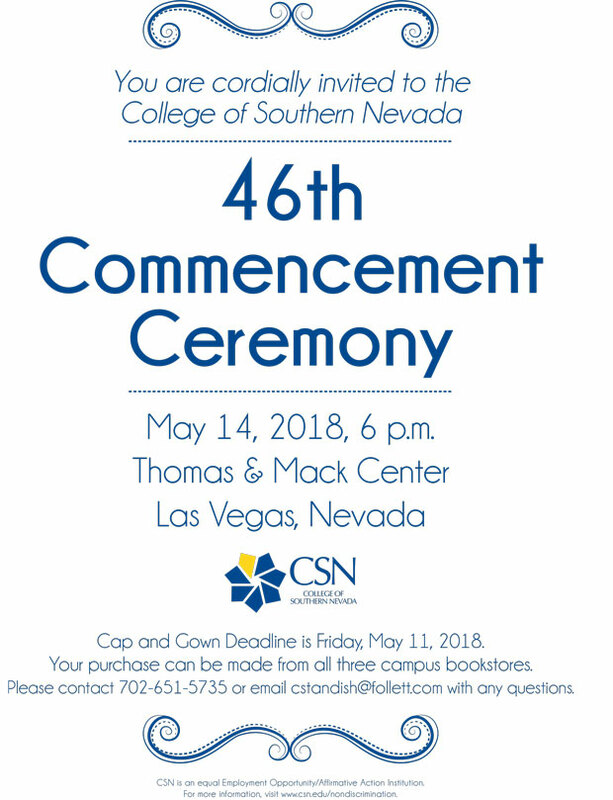 The 46th CSN Commencement Ceremony is all set for 6 p.m. Monday, May 14 at the Thomas & Mack Center on UNLV’s campus. We’re celebrating nearly 3,600 new college graduates! Wow. Come join us from 10-11:30 a.m. Thursday, May 3 for the official construction kickoff celebration for our new student union buildings. We’ll be behind Building C on the Henderson Campus, where you can stop by to enjoy refreshments, music and fun as we learn about the new unions. Architects and construction company representatives will be on hand with interactive building models, so you can “see” what the buildings will be like. I hope to see you there. If you’ve learned anything about me by now it’s that I love data. Love it. Used properly, it can help us figure out if we’re doing things right, or if we should try something else. Well, with the Jumpstart program, it looks like we’re doing things right. Jumpstart is one of several “concurrent enrollment” programs available at CSN. It allows high school students to earn college credit while still taking classes at their high schools. For a couple of different reasons, participation in the program has exploded in the last three years, from 600 students to more than 2,700. What’s even better is that these students appear to be doing phenomenally well. For more, please see the report linked below. 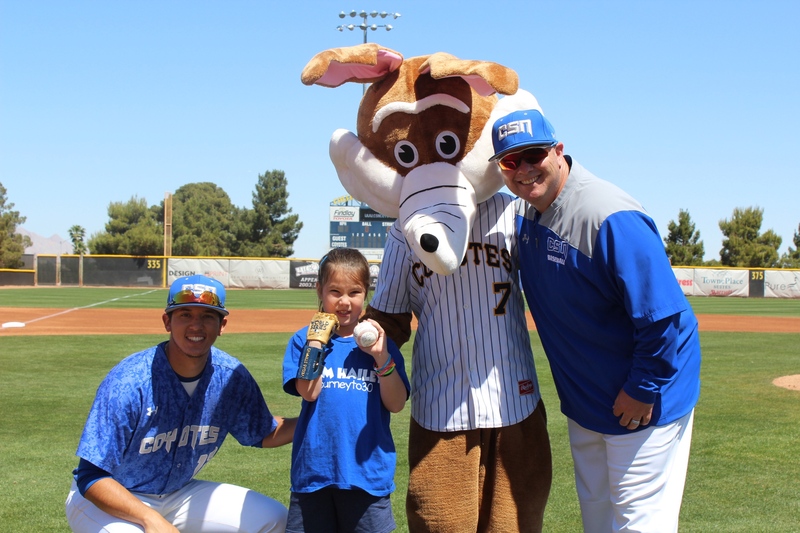 We were incredibly honored to have 8-year-old Hailey Dawson throw out the ceremonial first pitch before the CSN Coyotes baseball game on April 21. Hailey, as you may have seen in the news media, was born with a rare birth defect called Poland Syndrome, which led to missing and underdeveloped fingers on her right hand. Engineering faculty and students at UNLV helped design and manufacture a 3-D printed hand for Hailey, which she has been using to throw out first pitches at ballparks across the country in her quest to visit all 30 major league parks. We are so lucky to have been included on her tour. Thanks, Hailey, and good luck on your Journey to 30! You all know we have some truly amazing students here at CSN. We honored 21 of them last week at the Outstanding Student Awards ceremony. What an incredible group of people. Not only are these students succeeding in college, they’re succeeding in life, despite numerous hardships. But their drive never leaves them, ever. I’m humbled by every one of them. Drones, cranes, snakes and bugs! This year’s Science & Technology Expo was quite a spectacle. Schoolchildren from across the area flooded our North Las Vegas Campus last week for the 15th annual expo. I have to give a shout out to Dean Michael Spangler and everyone who worked so hard to make the event a success. Encouraging students of all ages to become excited about a STEM-based education is what the expo is all about. These fields are not only growing, they’re becoming more and more vital to our regional and national economies. Not to mention the fun. 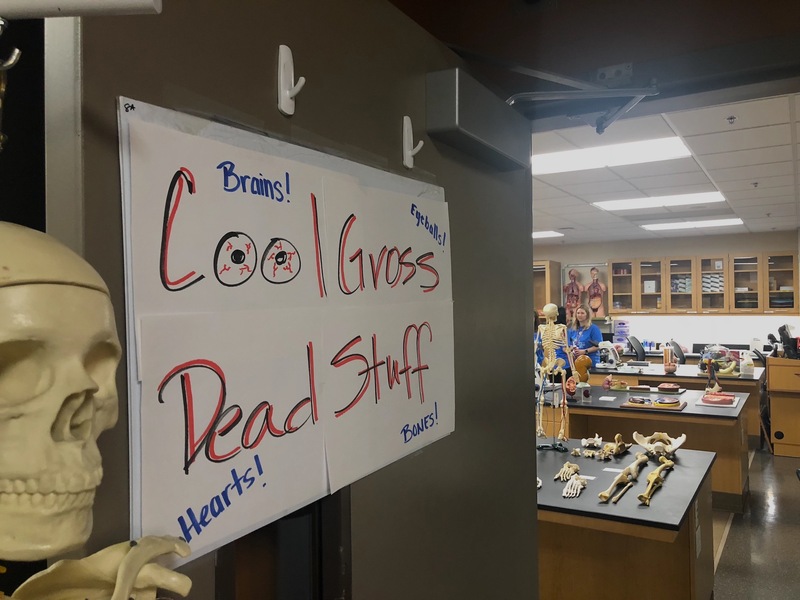 Who doesn’t love high-tech gadgets and cool, gross dead stuff? 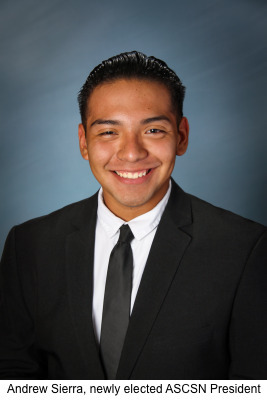 Congratulations to Andrew Sierra, our newly elected Associated Students of the College of Southern Nevada student government president! The election took place last week, bringing in a slew of new student representatives for the next academic year. Student Life and Leadership Development Director Brian Akins reports that turnout for the elections was up by more than a third over the previous year. That’s fantastic. Congratulations to all of the winners, and I look forward to working with you next year. This spring, the CSN Foundation Board of Trustees created the CSN Foundation Grant Program, which will give away up to $40,000 to faculty and staff to support 2018-19 academic year projects, events or activities that benefit our students, with a maximum award of $10,000. 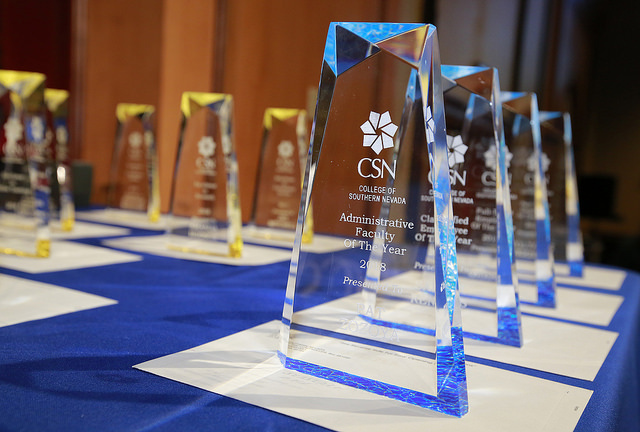 This will be an annual award competition each spring and bring transparency, consistency and accountability to how the CSN Foundation supports CSN events and other activities. The deadline to apply is May 14, so get your proposals ready! 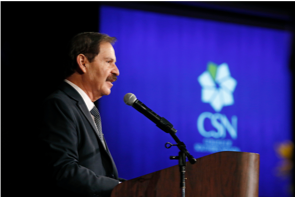 Thank you to the more than 400 people who came out to support the CSN Foundation Blooming in Blue gala in April to raise money for the construction of the CSN and Nevada State Health & Science Building. We honored three important community members during the celebration: Rossi Ralenkotter, Las Vegas Convention and Visitors Authority CEO, with the community achievement award, Switch with the community education award, and first responders with the community hero award. The event was a tremendous success, and we cannot wait until the next gala. I hosted the long-awaited Jamba Juice party last week, and we had a great time — all to benefit the CSN Foundation, of course. 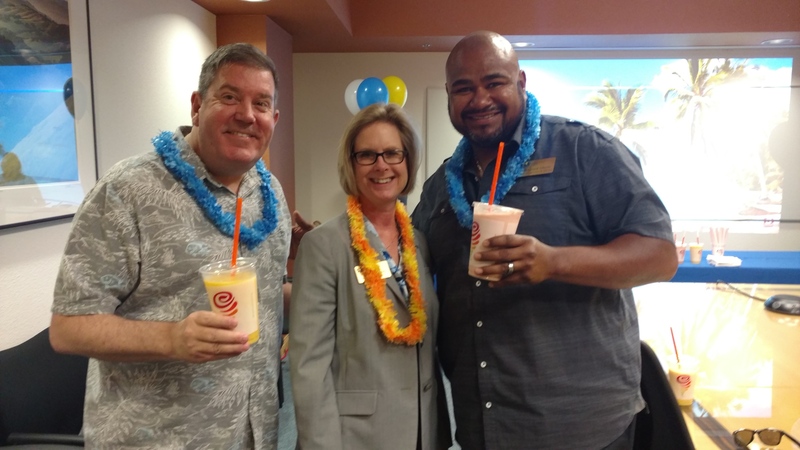 Employees who supported the college by making a Coyote Commitment of as little as $10 a month through payroll deduction were entered into a raffle to attend the party. Everyone enjoyed fun conversation and island music, wore leis, and were served tropical smoothies and light refreshments. It’s just one small way to thank employees for supporting the college. If you haven’t already, make your Coyote Commitment today. I have some bittersweet news: K.C. 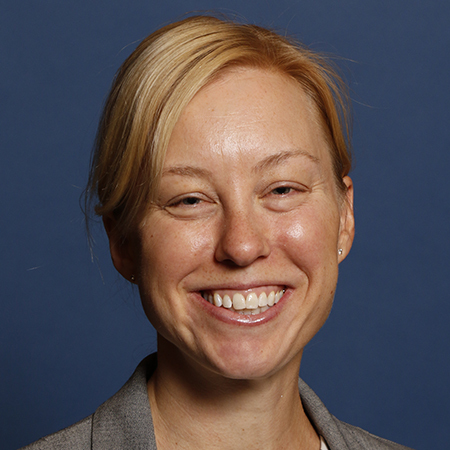 Brekken, the CSN Foundation executive director, is leaving us to become a research professor at UNLV. In more than a decade at CSN, she has served in many roles, including the college’s official spokeswoman, a trusted advisor and confidant, and our chief fundraiser. All along, she’s been our biggest cheerleader in the community. We will miss KC, but we know she is thrilled by the opportunity she has at the university. Please join me in wishing her well. Greetings, Coyote nation! I hope you thoroughly enjoyed your spring break. It’s always nice to have a little time off before the big push at the end of the semester. Before we know it, students will be taking final exams and we will all be celebrating another CSN Commencement ceremony. But first, I have lots of news to share this month about what’s been going on at CSN and some things to come. Please read on. We had good crowds at the three roundtables held for faculty and staff and the pizza with the president events for students in March. We talked about everything from new programs, textbook prices and police services to how Britney Spears figured into my behind-the-scenes introduction to Nevada. You had to be there. I was pleased with the turnout at these events because one of the first things I wanted to accomplish when I was asked to step in as acting president was to ensure that I was accessible to you all. I want every faculty and staff member to feel comfortable talking about what’s going on at CSN or asking whatever questions he or she might have. The same goes for students. I am here to serve you, and them. If you missed the roundtables and you have questions or ideas you wish you could have shared, please do so. Email me at president@csn.edu. 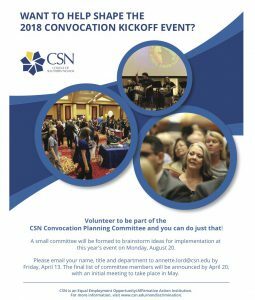 We are just getting started on planning the 2018 Convocation Kickoff event for this year, and we’d love your help. We are looking for volunteers to join the Convocation Planning Committee. This will be a small group designed to brainstorm ideas for the event, scheduled for Aug. 20. Please contact Annette Lord by April 13 if interested, and please check in with your supervisor first. 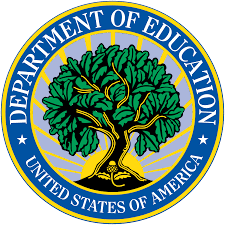 Linked below is a letter from the U.S. Department of Education notifying us that we will continue to be considered both a Hispanic Serving Institution and a Minority Serving Institution. This is wonderful news, and not just because the label is accurate. Such designations by the Department of Education enable CSN to apply for Title III and Title V grants. These grants, while awarded because of MSI or HSI status, benefit all of CSN. The Department of Education recently notified CSN that the college is on provisional status regarding financial aid programs. Typically colleges are recertified to award financial aid every six years. We are currently on provisional status through March 2019 because of a missed deadline in 2015. Despite this misstep, we have made the necessary corrections and have had very positive communications with the Department of Education. CSN continues to be authorized to award financial aid to students who qualify. We are also continuing to submit our new degrees to the DOE for financial aid qualification. This provisional status will not affect our students, nor will it prevent CSN from developing and offering new degrees. One of the highlights of the year is recognizing those who have made extraordinary contributions to CSN and the success of our students. We celebrate these superstars each year at Convocation in August, but now is the time to nominate an outstanding colleague for one of these awards. The deadline is 5 p.m. today. Please see the link below for details. I look forward to congratulating the winners this summer. 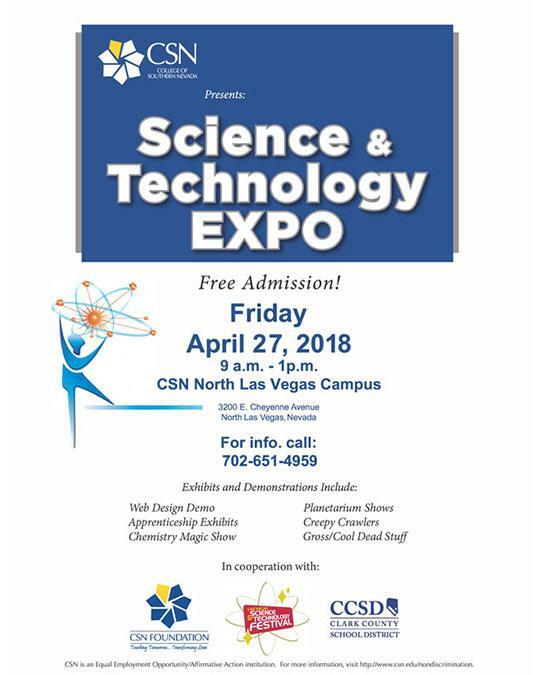 For the 15th year in a row, CSN will be hosting and the Science & Technology Expo from 9 a.m. to 1 p.m. Friday, April 27. This will take place on the North Las Vegas Campus in and around the A and C buildings. These events are a thrill to attend with upwards of 2,000 students from participating Clark County School District schools, as well as members of the public. They’ll get to see exotic animals, courtesy of CSN’s Veterinary Technology program, flight simulators from our Aviation Technology program, a magic show, thanks to our chemistry department, shows in our wonderful planetarium and so much more. The goal here is to ensure the students enjoy their day at CSN, of course, but also to help them become excited about science and technology. As our economy becomes ever more dependent on tech-related fields, it is imperative that the next generation of college students embraces the STEM disciplines. Thanks to CCSD, the CSN Foundation and the Las Vegas Science & Technology Festival for co-sponsoring this great, fun event. Commencement is why we do what we do. We will gather at 6 p.m. May 14 at the Thomas & Mack Center with a couple thousand CSN students for the most exciting event of the year. There will be plenty of pomp and circumstance! There will be speeches, too, though I promise to keep mine as short and to-the-point as possible. But what we will all really be there for is to celebrate what is likely to be another record-sized graduating class. Upwards of 3,000 degrees and certificates will be awarded. 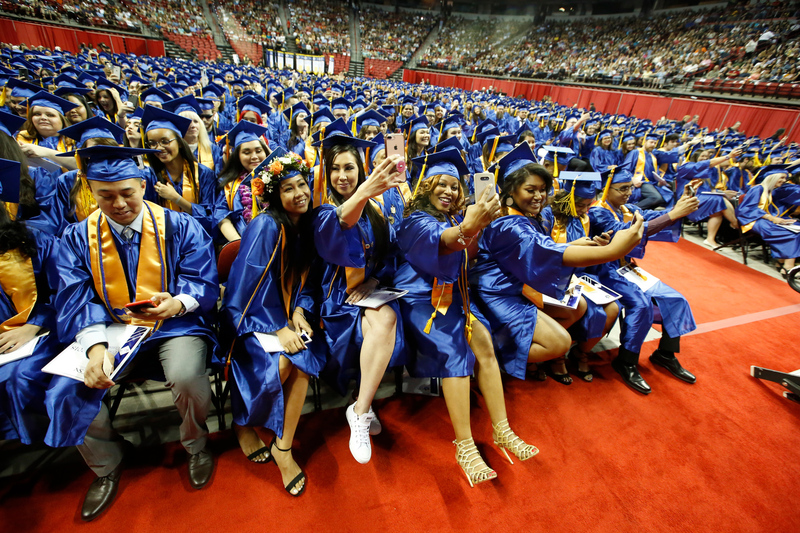 That’s 3,000 new college graduates, the vast majority of whom will stay in southern Nevada. It’s a special time for them, for us, for our entire community. Please join me at the event. I promise you’ll enjoy yourself. 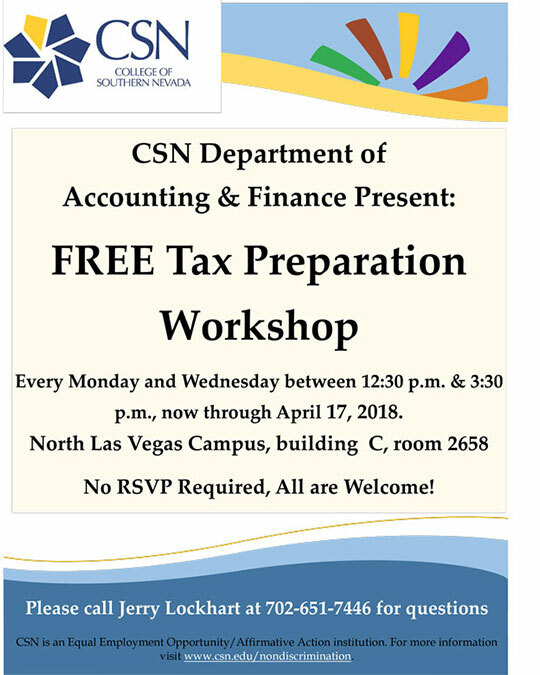 As springtime become crunch time for taxes, CSN’s Department of Accounting and Finance is here to help. Now through April 17, the department is offering a free tax prep workshop at 12:30 p.m. and 3:30 p.m. every Monday and Wednesday. Anyone can come, and all help is free. This is a great way for our students to get experience working with clients. Last year, this team of volunteers helped complete approximately 300 returns. As we dive deep into our Achieving the Dream numbers, there is evidence that the First Steps student success initiative is making a difference. This initiative, first put in place in 2014, requires new high school graduates to take placement testing, attend orientation, and receive advising. The data show that First Steps seems to be helping close achievement gaps in graduation rates, as evidenced by First Steps Pell and minority students graduating at a higher rate than their non-First Steps counterparts. In addition, First Steps students stay at CSN longer and take more credits than their counterparts. As we further analyze the data, we are expanding our student success efforts by developing adjunct faculty professional development programming, continuing vigorous assessment, focusing on guided pathways for students, and leveraging our ATD Leader College status by attempting to take advantage of special grant and recognition opportunities. Please take a look at the document linked below for more information. Please review the latest enrollment report at the link below. This updated report reflects our census date total for Spring 2018. This census date is a system-wide standardized reporting date on which each institution provides a snapshot of student data, including preliminary enrollment counts. Visit the Institutional Research web page to see additional enrollment and institutional data. 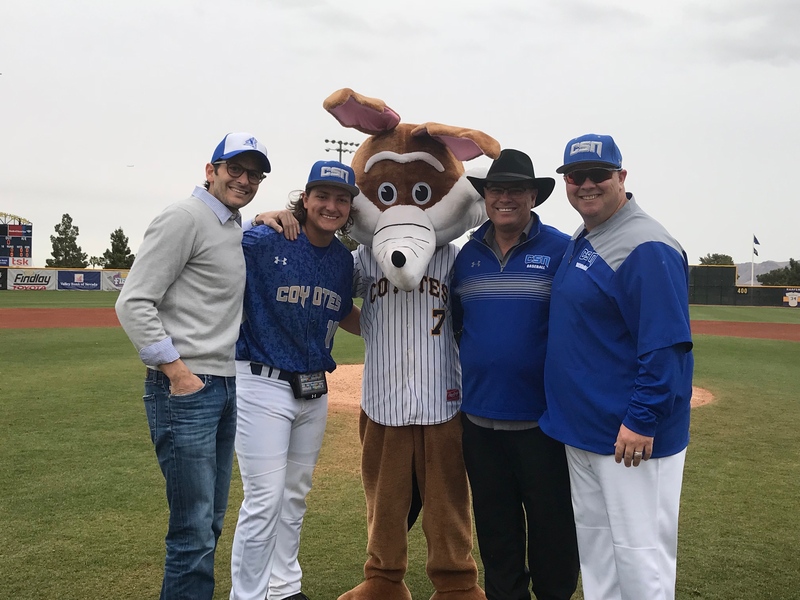 We were delighted to welcome Nevada System of Higher Education Regent John T. Moran to the CSN Coyotes conference play opening weekend, where he threw out the ceremonial first pitch on March 9. Our Coyotes continued an amazing year so far and won that game. The team’s most recent ranking is fourth in the nation! Wow. Go Coyotes! CSN Athletics will honor its finest male and female student athletes at the annual Student Athlete Awards Banquet, to be held at 6 p.m. April 24 at the Eastside Cannery Hotel and Casino. I encourage you to attend for a night to remember. Show your Coyote Spirit as we celebrate the best and brightest. The CSN Coyotes will also be holding its VIP Baseball Experience raffle this spring. The winner and a guest will fly round trip to Denver for a two-night stay! Included are two seats to watch former CSN Coyote Bryce Harper and the Washington Nationals face former CSN Coyote Mike Dunn and the Colorado Rockies on September 28 or 29. This is a great way to support our program. The CSN Office of Alumni Relations’ Coyote Howl event was a howling success. Hundreds of students attended the event, designed to provide information about our graduation and life after CSN. 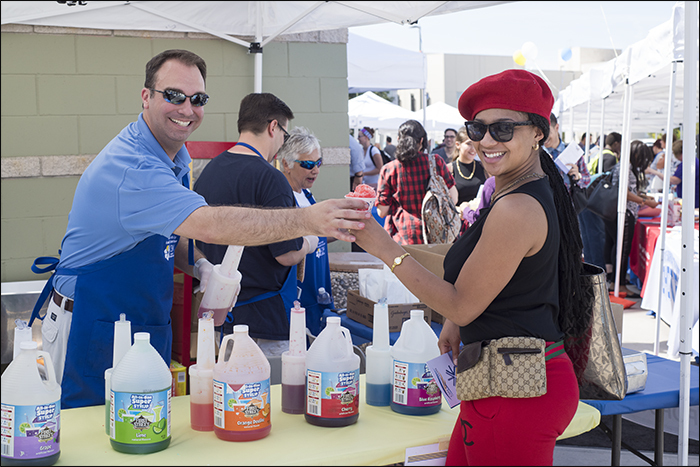 In addition to gathering useful information, students purchased caps and gowns, had professional photos taken, sang karaoke, and enjoyed Pepsi, pizza, funnel cake and all the best goodies. Many thanks to Jamille Walton, Michelle Word, Ashton Ridley, Pat Zozaya, Kim Booth, Hieu Le and Lisa Foreman for putting the event together. Congratulations to Tina Holcomb, financial aid assistant director, for winning the March parking space raffle! This year’s Diversity Week was full of workshops, presentations and events, and was capped off by the annual Diversity Recognition Awards breakfast on Friday, March 12. In addition to honoring CSN faculty and staff who worked hard on diversity-related issues over the last year, the 2018 CSN Diversity Excellence Award was presented to Michael Kagan, director of the UNLV Immigration Clinic, for an outstanding commitment to diversity and inclusion. Congratulations to all! Greetings, Coyote nation! We are approaching the mid-point of this spring semester, and I hope all is going well. I have information on several different topics for you in this month’s Chronicle, everything from the presidential search to successful fundraising efforts to our baseball team’s stellar season so far. Please read on. 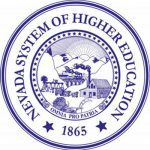 The Nevada System of Higher Education ad hoc CSN President Search Committee has hired search firm Wheless Partners to conduct a national search for the next CSN President. The advisory committee, made up of community members and CSN faculty and staff, stressed that a strong commitment to diversity and inclusion, student success and the college’s transition to a multi-campus district model are critical elements that the new president must embrace. The firm will conduct an active search, meaning that as well as placing ads in traditional forums, they will also actively recruit potential candidates from across the nation. Chancellor Thom Reilly and Wheless will narrow down the pool of applicants to a list of semifinalists and interview each of them. They will then bring the best two to five candidates to the committee as finalists to be interviewed in public by the committee as a whole. The goal is to have a new president in place in time for the fall 2018 semester. Linked below is the CSN accreditation response letter from NWCCU for which we have been patiently waiting. You will see that the news is quite positive, but we still have much work to do as we prepare for the mid-cycle report that is due to Northwest in late summer in anticipation of our mid-cycle visit in Fall 2018. We will be continuing the assessment work that has been ongoing, and we will be convening various stakeholders to enhance our strategic plan, ensuring that institutional learning outcomes, assessment, and resource allocation are aligned with our plan – and that the work we are doing aligns with the recently adopted NSHE goals. Remember, we need everybody’s shoulder to the wheel! In the upcoming months, we are going to accomplish amazing things – together! 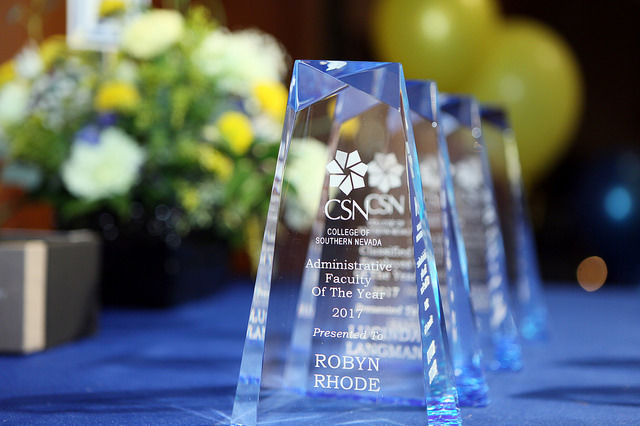 Congratulations to all the hard-working CSN faculty and staff members who were awarded tenure earlier today by the Board of Regents. For a full list, see the link below. I am pleased to announce that Dr. Maria Schellhase will be the new interim chair of the Department of Business Administration at CSN. Dr. Schellhase is a business administration professor and the recipient of numerous honors and awards. 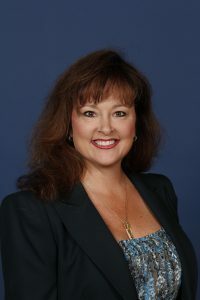 She holds master’s and doctorate degrees in Business Administration, has served as the corporate director of central reservations for Station Casinos and spent more than ten years as an investment advisor (stockbroker), portfolio manager, and vice president of client relations for several leading business organizations. I will be holding roundtables on each campus this month. Please come with your questions and comments. 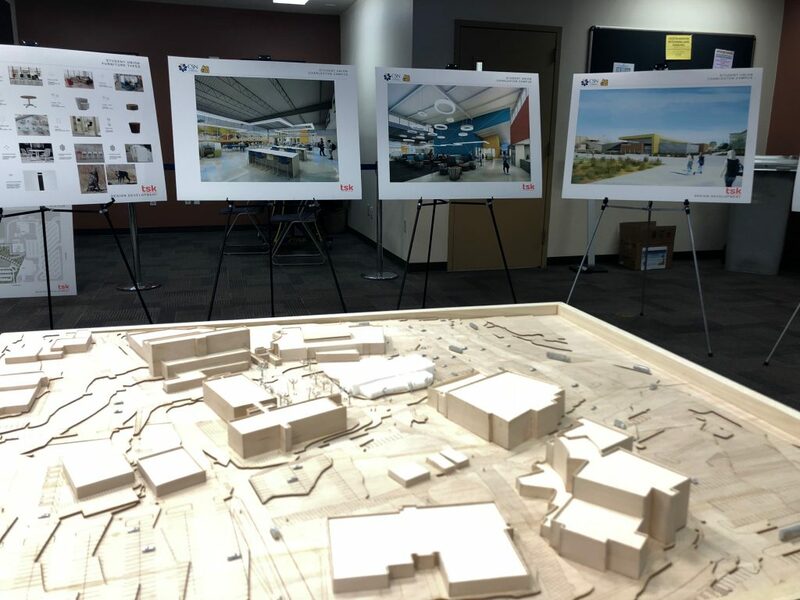 Senior Associate Vice President for Facilities Management Sherri Payne and her team put on a series of fantastic presentations last month featuring 3-D models, detailed drawings and a virtual reality display of our new student unions. The student government has worked tirelessly with the architectural firm Tate, Snyder, Kimsey, this year to develop the schematic and throughout the design development phase of the project. Their hard work and excitement is illustrated in the design features. As you know, we are building nearly identical student unions on each campus and expect them to be open by the fall 2019 semester. If you weren’t able to make one of the sessions last month, see the links below for photos, floorplans and more. We have yet to set a firm date for the groundbreaking, but we hope to get it done before the end of the semester and celebrate this milestone with students. Keep an eye out for communications about that in the coming weeks. Over the past three years CSN faculty have taken great effort to improve our assessment efforts. Numbers from 51 programs across three schools tell us that the variety of assessment measures have increased, and more direct and authentic measures are being used. Please see the link below for more information. Please review the latest enrollment update at the link below. This update reflects enrollment through Monday, February 26. Visit the Institutional Research web page to see additional enrollment and institutional data. I am excited to share the news about some of our recently secured grants in the process of implementation, more than $80,000 in grants across various departments. This represents just a portion of the many grants we have in place. Two grants help fund biomedical research on gluten free food and organisms in Mexico’s caves, while two others fund our Nevada Grow small business program and CSN landscaping efforts. Another will help us market our developing unmanned aviation systems and cybersecurity degrees. Many thanks to the Office of Sponsored Projects and everyone who worked diligently to secure these funds. 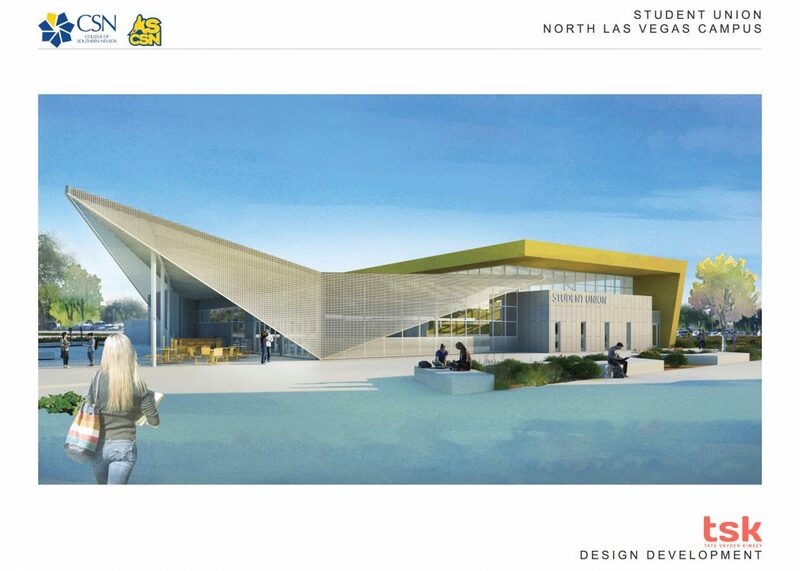 The Engelstad Family Foundation announced the first major gift of $3 million for the proposed CSN and Nevada State College Health & Science Building. 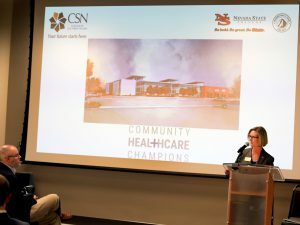 The gift announcement kicked off the CSN and Nevada State foundations’ joint capital campaign to raise private dollars in support of the building. The gift is a match intended to help raise another $3 million from the community before the start of the next legislative session. CSN and NSC proposed the facility to expand training for healthcare professionals this community needs. 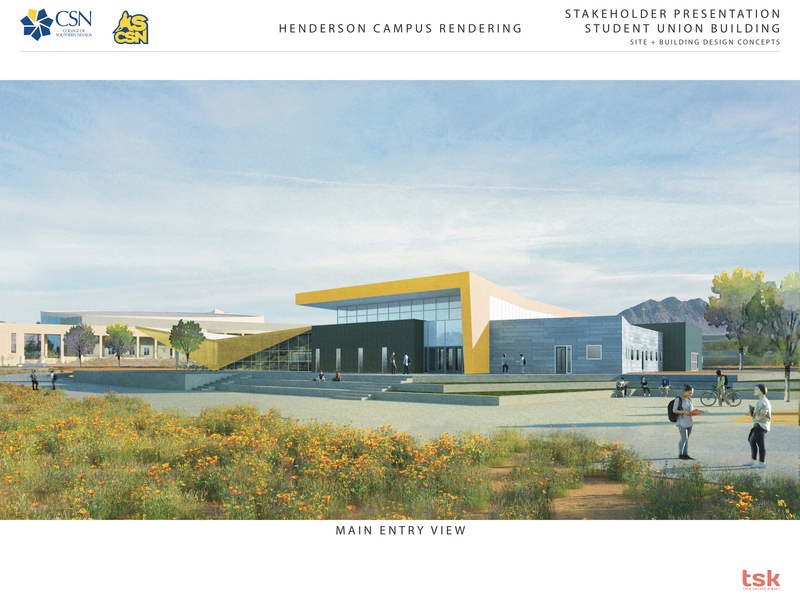 The Legislature has allocated planning funds for the 70,000-square-foot facility, which will be located on our Henderson Campus. We will ask for approximately $35-$40 million in the next legislative session to construct the building. To take advantage of the CSN faculty and staff special price of $175 per ticket, please call the CSN Foundation at 702-651-7301 for more information or to purchase your tickets today! Following the gala, the CSN Foundation will host a variety of accessible and creative opportunities to show your support for the college throughout the year. Make Your Coyote Commitment Now! Coach Garritano Nabs Win 600! 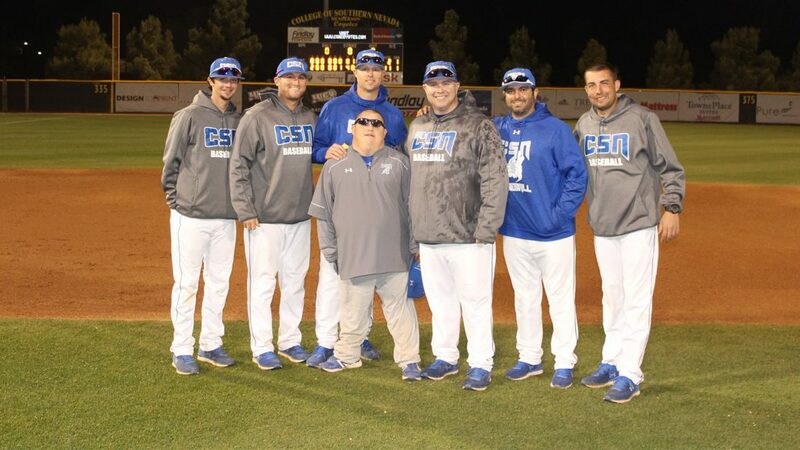 Congratulations to CSN Coyotes baseball Coach Nick Garritano, who joined an elite club of coaches last month when he earned his 600th career win. Wow! Before joining the Coyotes, Garritano coached the Green Valley High School Gators for 11 years, where he won over 300 games, including two state championships. He has been at CSN since 2011. Please join me in congratulating Coach Garritano on a major milestone. The CSN Coyotes baseball team is on quite a roll, winning its last 14 games in a row for an overall record this year of 18-4. The team, which earned a Junior College World Series appearance last year, is doing so well that it’s moved up to number three in the national rankings! Go Coyotes! 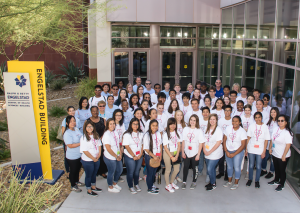 With more than 5,200 students from schools all over southern Nevada having already completed the required training to receive the Nevada Promise scholarship, it is now time for mentoring. We have more than 70 mentoring sessions already scheduled, with more hitting the books every day. Close to 1,000 mentors have signed up, and we could always use more. I’m excited to meet my own mentees. We expect this program to be a huge success and hope the Legislature continues to fund it in the future. The CSN VETS Center is entered in the NV Energy Foundation Power of Good Giveaway. You can cast your vote beginning March 12 to help the center win $10,000.